Travelling across unfamiliar ground atop a sentient creature with a strong flight instinct might sound a bit risky to most people. For equestrians, it sounds like a day well spent. But for landowners who open their land to horses and riders, that idyllic ride can often look like a lawsuit waiting to happen. These fears can be eased though an understanding of some basic protections provided by the states. Private lands play an increasingly important role in our shrinking equestrian landscape due to loss of land to development and a growing demand for available public lands. As available horse lands decrease, it is imperative that equestrians understand how to explain the liability implications to private landowners and that landowners have better access to accurate information about their states’ liability laws. Every state in the United States offers protection to landowners who allow other people to use their land for recreational purposes through Recreational Land Use laws (RLUs). Landowners are protected from liability except in cases of extreme negligence, for a variety of recreational uses, including trail riding, cross country riding and schooling. Forty-six states also have laws that specifically protect landowners who open their land for horse related uses through an Equine Activity Liability Act (EALA). Every equestrian should be familiar with these statutes and be able to explain them to landowners. RLUs were put in place to help encourage landowners to allow access to privately held land for recreational purposes, such as hiking, biking, horseback riding, hunting, etc. Nearly all states specifically include horseback riding in their RLUs. A handful of states have specific limitations on the protections provided by RLUs, such as enrolling in a state land use program or limiting the types of lands that may be used for recreation. Equestrians and landowners should make themselves familiar with the laws in their particular state. Under RLUs, landowners may receive a nominal fee for allowing recreational access without incurring liability. Rules vary by state and landowners should consult their state statutes to understand the implications of charging fees. However, under all RLUs the landowner’s liability will increase if they are offering instruction or supervision for the recreational activities allowed on the property. For example, a landowner may accept a fee to access a cross country course without incurring liability but will increase their liability if the user is paying for instruction from the landowner or designee while riding there. EALAs provide protection for equine professionals and would protect the landowner described in the example above. Equine professionals are broadly defined as instructors, people operating boarding facilities or otherwise generating income by creating opportunities for people to interact with horses. 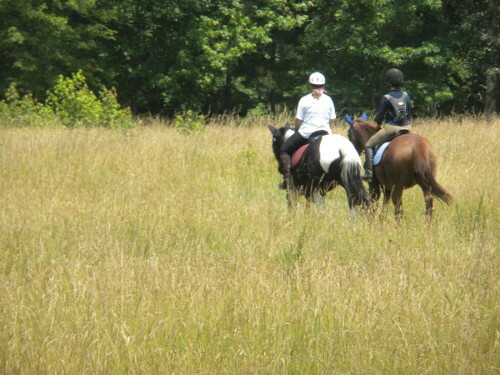 EALAs provide protection from all inherent risks of interacting with horses, whether directly under the supervision of a trainer or in a permitted, unsupervised interaction like a trail ride. They do not, however, shield an equine professional from liability from non-inherent risks or their own negligence. Forty-six states have EALAs that limit the liability of equine professionals, event organizers, stable owners and horse owners. Three states that do not have specific EALAs, Maryland, Nevada, New York and California, have a strong history of case law protecting landowners from liability, and New York is considering an equine liability law. EALA protections vary slightly by state but all are based on the idea that riders accept the inherent risk that comes with riding a horse. Inherent risk refers to the things that can foreseeably happen when interacting with horses, including being thrown, bitten, kicked or trampled. Under EALAs, landowners and equine professionals are not liable for injury or death resulting from one of these inherent risks. Equine professionals may be liable for injuries resulting from non-inherent risks, however. For example, a landowner may be liable for an injury of a user resulting from the collapse of poorly stacked hay bales but while they would not be responsible for an injury resulting from a rider falling from a horse on to that same stack of bales. Equine professionals are also liable if they display willful and wanton disregard for the rider’s safety or if they failed to make the participant aware of a dangerous situation that the owner knew about before the activity began. For example, knowingly providing a rider with defective tack or failing to warn trail riders about an unstable bridge could result in liability for the equine professional if death or injury results. Most EALAs also require landowners to post signs warning participants that they are assuming the inherent risks of being around horses merely by being present on the property. These ubiquitous signs are inexpensive and readily available. Landowners should consult their state’s statutes. While RLUs and EALAs provide excellent protections for landowners, liability waivers provide an important additional protection. Liability waivers are simple but important legal documents that should be signed by any adult or adult representative of a minor riding on private property. Even if a landowner does not require one, it is good policy for users to provide them to the landowner. Liability waivers provide documentation that the participant has notice of the risks they are assuming and provide landowners with an additional measure of protection. People signing these waivers are acknowledging that they are giving up their right to sue for any injury that may result from their participation in an inherently risky activity. Even though RLUs and EALAs provide strong protections for landowners, liability waivers are strongly recommended as an additional protection. Examples of waivers can be found at www.elcr.org.